Ta-Nehisi Coates, Sally Mann, Lauren Groff Lead Shortlists For 2015 National Book Award : The Two-Way Lauren Groff, Terrance Hayes, Sally Mann and Ta-Nehisi Coates are among the 20 writers still in the running for the prestigious literary prize. Soon, that number will be whittled to just four winners. 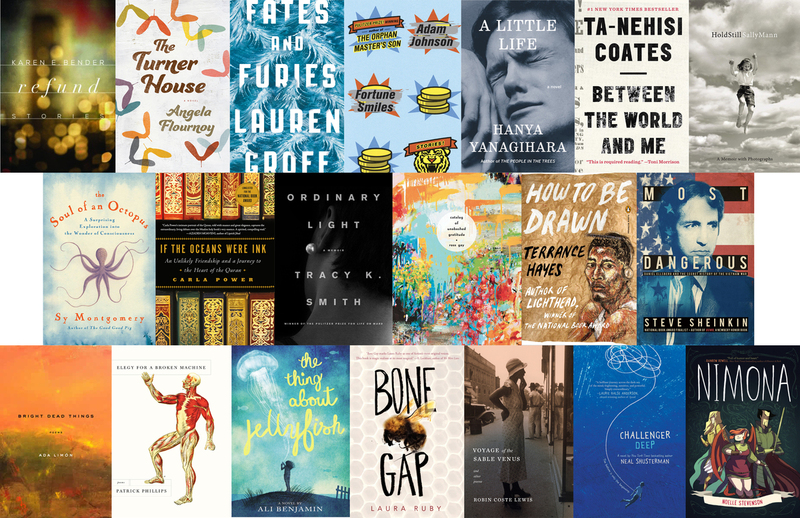 2015 National Book Awards finalists. On the fiction side, Hanya Yanagihara's novel A Little Life adds to a stellar record so far this literary awards season. The tome — which NPR's John Powers calls "a wrenching portrait of the enduring grace of friendship" — has already earned a spot on the shortlists for the Man Booker and Kirkus prizes. Joining Yanagihara's novel are Lauren Groff's Fates and Furies — "a master class in best lines," says reviewer Jason Sheehan — and Fortune Smiles, a globe-trotting collection of stories from Pulitzer Prize winner Adam Johnson. Karen E. Bender's collection Refund and Angela Flournoy's The Turner House round out the fiction list. All of the writers on the fiction shortlist are first-time finalists for the National Book Award. Given the kind of year that Ta-Nehisi Coates has been having, it would be tough to consider his Between the World and Me anything less than a favorite to win the nonfiction prize — though photographer Sally Mann's Hold Still, a memoir threaded with photos, could be considered a close second for that distinction. Like Mann, Tracy K. Smith also comes to nonfiction from another genre, having previously won a Pulitzer for poetry; Ordinary Light is her first memoir. Meanwhile, among the poets themselves, Rowan Ricardo Phillips' absence from the list is sure to surprise some — while Terrance Hayes' inclusion, for How to Be Drawn, should surprise no one. The celebrated poet has been here before, with an NBA win just five years ago. Robin Coste Lewis, however, is new here — with Voyage of the Sable Venus, a debut she published while still a student (getting her Ph.D.). Yet she's not the youngest writer on this list. Noelle Stevenson, in her early 20s, may take that honor. Her comic Nimona, which first developed as a biweekly post on the Web, earned a spot on the slate of finalists for young people's literature. Winners in each category will receive a bronze sculpture and a purse of $10,000, at a ceremony in New York City on Nov. 18.